Kuwait isn’t a place one would naturally associate with freedom and democracy. The country and its nationals are often derided by other Gulf Arabs for a number of reasons (if you live in the Gulf you’ll understand what I’m talking about here). When talking about civil protests in the Gulf area a common refrain has been to ask “why are there any protests at all?” The perception is that Gulf Arabs have money, and that they are looked after and provided with all that they may need by their respective governments. This may be true in some cases, but it misses the point entirely. 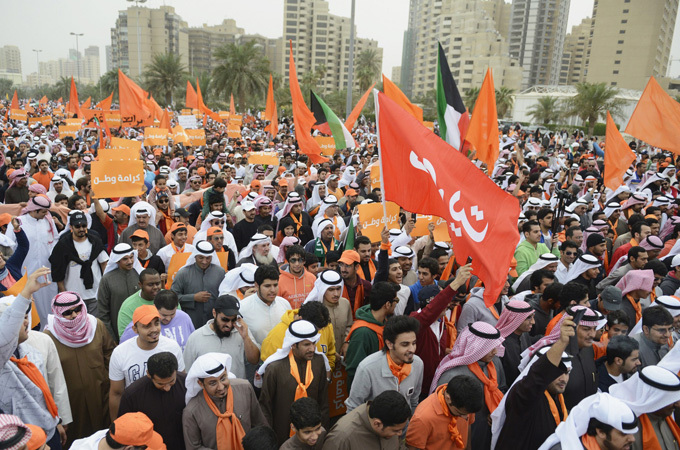 Kuwaitis are demanding more say in their government and how the country is ruled. The challenges in Kuwait are best summed up by Kuwaiti opposition leader Musallam Al-Barrak in his article for the Guardian newspaper. You can read the article here, but I will also quote from it below. We are protesting against an unconstitutional change in the electoral law pushed forward by the emir. The electoral system divides Kuwait into five districts; 10 parliamentarians are elected from each district. Previously people could cast four votes per ballot, but the new law permits voters to cast only one. This change aims to quell the national assembly’s role, as it facilitates the governing authority’s control of electoral outcomes – which in turn undermines the country’s democratic legitimacy. On a deeper level, however, the demonstrations are against individual rule, something Kuwaitis have long and actively refused. In 1962, when the current constitution – which limits the governing authority’s role – was issued, it established that the public has the right to impose its opinions on the emir through the elected national assembly – a right that the governing authority refuses to acknowledge. The current struggle is therefore a struggle for power. Is power – as stated in the constitution – for the public, or is it – contrary to the constitution – for the emir? The majority of people also believe that the government, representing the ruling family, is not serious in its battle against corruption. In fact, people are convinced they are sponsoring it. This belief was one of the reasons behind the dissolution of the 2012 parliament and the recent changes in the electoral system, following the opposition’s exposure of evidence that state money was being transferred to private accounts in London, Geneva and New York, and of the previous government bribing parliamentarians in 2009. I for one am proud of the Kuwaiti people for standing up for what they believe to be their rights and against the actions of Kuwait’s ruler. They’ve shown bravery, determination, and a belief in themselves despite the very real risks to themselves. Kuwait’s people, both men and women, clearly believe in themselves and their ability to take the country forward. Kuwaitis have proved that they are prepared to risk a great deal for the right to govern themselves and fight corruption. In his article for the Guardian Al-Barrak writes that in the end the people of Kuwait will be triumphant. I would hope that any victory for democratic participation in Kuwait would be felt by others across the Gulf. Will we one day look back to Kuwait in 2012 and say this is where the Gulf’s Arab Spring began? Today Kuwait and its people should be seen as the pride of the Gulf. While the country does seem to be going through an unprecedented crisis, I do also feel that the Emir of Kuwait should be recognized to an extent for allowing protests (or at the very least, not cracking down in the same/similar manner to his GCC neighbours). Maybe I’m wrong on this, but Kuwait would seem to be the one country in the Gulf which allows for its nationals to protest openly. While I have read about and been told of attempts to use force and arrests to dispel protestors I certainly couldn’t imagine these scenes being repeated in any other city in the Gulf as of today. For more on what is happening in Kuwait watch the below report from Al Jazeera’s English channel which makes for fascinating viewing. This entry was posted in Culture, Journalism, Kuwait and tagged Al Jazeera, Al-Sabah, Arab Spring, civil rights, democracy, Guardian, Kuwait, Musallam Al-Barrak, politics by alexofarabia. Bookmark the permalink.